Don’t know your operator from your synchro? This mechanism has lever-operated, back angle adjustment that can be locked in any position or left unlocked to follow the user’s movement in dynamic free float mode. Similar to the Operator mechanism but with additional lever-activated seat tilt adjustment. Where indicated, most Operator Plus mechanisms also include tension control in the back angle movement to adjust for variation in user weight. Back and seat recline together in a 2:1 ratio, can be locked in position or left in free-float mode to follow the user’s dynamic movement. These chairs also have adjustable tension control. Combining the smooth operation of a synchronised mechanism, with the breadth of adjustability of an Operator Plus mechanism; the back angle can be adjusted independently of the synchronised seat and back recline. Back and seat recline in a 3:1 ratio. They can be locked in position or left in free-float mode to follow the user’s dynamic movement. The mechanism automatically adjusts to body weight for individually tailored support. A seat slider allows the horizontal adjustment of the seat length, offering increased leg support when required. This function is beneficial when the chair is used by multiple users, to accommodate differing seat depth requirements. Essentially, this is an office chair and is also called an operator chair. One of the first innovators was Charles Darwin who put wheels on his office chair so as to more swiftly reach his specimens. It’s evolved since then to include a swivel function and controls to adjust height and position of seat and back, tilt, arm position, and the sophisticated ones will allow you to adjust seat firmness, recline position and resistance. This section includes seating and tables for collaboration. The chairs on the other side of your desk when someone pops in for a chat and furniture for meeting rooms. 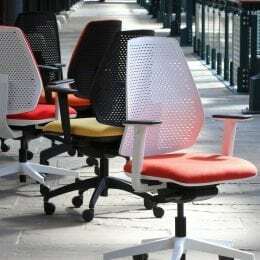 Most of these are cantilever chairs, in keeping with our task chair ranges to keep the look consistent. Elegant and comfortable, they make a good meeting better. And most meetings tolerable. A collection of soft seating, sofas and armchairs to create a great first impression on those arriving at your business and dynamic seats to continue that sentiment when you bring guests into the boardroom. Set the tone from the off with striking reception and boardroom furniture which resonates with who you are as an organisation. 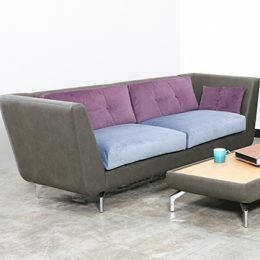 A collection of sofa suites, modular lounge furniture and deeply comfortable arm chairs. These ranges offer the ability to create sound-deadening collaboration zones, relaxed booths for breakout areas, sumptuous solo sofas for lounge areas and flexible, fun perches with pouffes. 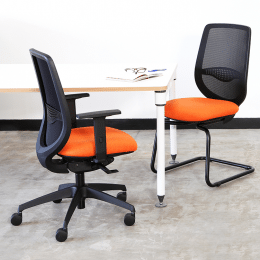 Chairs which stack – perfect for multi-use spaces and with our durable but lightweight ranges, the set up and breakdown is easy peasy. Trolleys are available to make the moving and storage of the stackers back-friendly and some chairs come with optional linking to keep the chairs neat and easy to access while in use. Ranges are available with tablets and most have the option of upholstered pads for improved comfort. Create corner sofas, cosy booths, circular arrangements or sweeping arcs of comfort with our modular ranges. These are sofas and soft seating in jigsaw-like pieces to allow you to create shapes and dimensions according to your room size and requirements. Increasingly popular in the agile office as employers recognise the importance of being able to step into a different zone for collaboration, to take a break or to sneak off for some quiet concentration. This class includes waiting room furniture, and a variety of other seating for healthcare scenarios. We have chairs with an anti-bacterial lacquer and seating designed to accommodate 24 hour use up to 200kg in weight. Robust, easy to clean and classic in design. Hardwearing and design to meet the heavy duty needs of a production or laboratory setting, these ranges are practical, and comfortable. For spaces where relaxation, socialisation are key, these ranges are elegant, stylish and will enhance the ambiance. 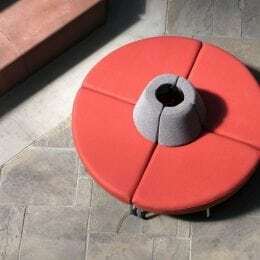 We’ve developed deeply comfortable hotel restaurant armchairs, flexible chairs for multi-purpose spaces and outdoor furniture for making the most of the great outdoors. Fun pieces to complement and restore the user.